There are some tough times that go with living. They're inescapable. That's when our confidence in the Lord's salvation and our relationship with him get tested! It is one thing to sing "it is well with my soul" at the end of a peel the paint worship service, but it is quite another to be able to sing it when they auction your house off at the courthouse steps, you are told you have a long-term debilitating illness, or you lose a child to death. Faith can't take a holiday when we travel through the suburbs of hell or we'll never find our way out. So don't throw it away. 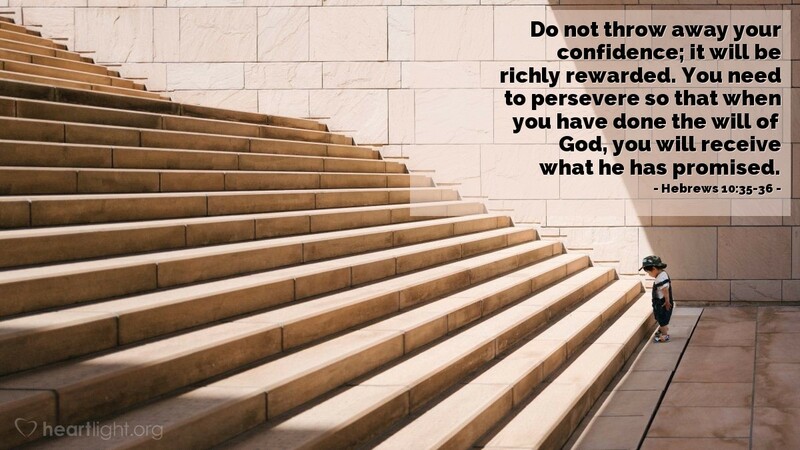 Persevere! Keep putting one step in front of the other trusting that God will give you the strength for the next step. No matter how hard it is at the moment, don't give up to despair. Be like Job or Jeremiah who both argued and complained to God, but never let go of God. Don't quit. Christ is coming, for you with grace or in glory once and for all, is just around the bend. Holy and Almighty God, today is a good day. However, I am profoundly aware that some of those I love are close to throwing away their confidence in your love, mercy, grace, peace, and deliverance. Please use me to encourage them. Even more, dear Father, I ask that you use your Holy Spirit to renew their hearts. I pray that you intervene directly to change the course of events and give them relief and make your gracious presence known to them. In Jesus' name I pray. Amen.